by Bill Dwight on Monday, January 23, 2012 at 4:08 PM | LEAVE A COMMENT! I’ve been waiting patiently for Twitter to switch our @FamZoo account over to their new user interface which includes the “Embed this Tweet” feature. Well, today was the day. Now I can post my favorite pair of tweets. Throughout the year the boys set aside a portion of their allowance for sharing. My youngest convinced the family to give to @WorldVision. (cont). One goat, two chickens, and four soccer balls are on their way to people in need. 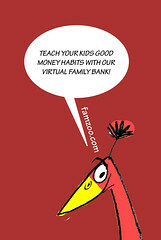 Thx also to @FamZoo for making allowances easy! We’re harnessing the latest Internet technology to lower the effort bar for parents to mentor their kids in key life skills, like personal finance. That’s what we mean by our tag line: “Preparing kids for the wild.” Along the way, we have a “secret” ulterior motive — get kids involved in philanthropy, and make it a life long habit. Validating tweets like these make the last 6 years worth all the effort. Onward and upward!